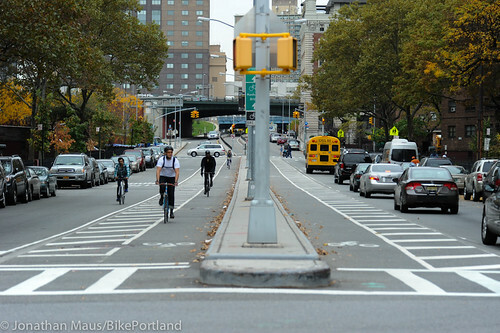 bike commute into Manhattan would have in store. 29-year old Brooklyn resident Molly Fair was like many New Yorkers in the aftermath of Sandy. The shutdown of subways and buses left her stranded from her job. Fortunately for her, she had a bike; but that alone wouldn't have been enough to get her to ride it to work. 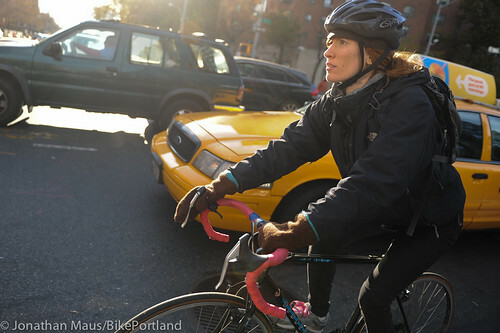 That's because, like a lot of New Yorkers (and Portlanders for that matter), Molly felt unsafe riding in traffic. 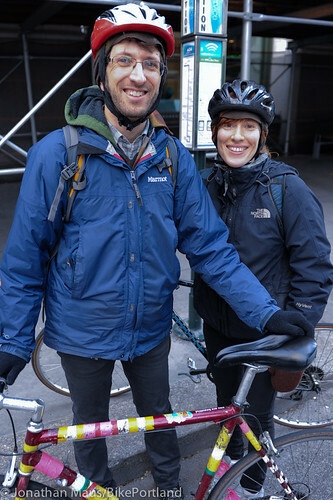 But the impacts of Sandy, and the bike advocates that swung into action in its aftermath, turned out to be the nudge she needed to give it a try. And I happened to come along for the ride. 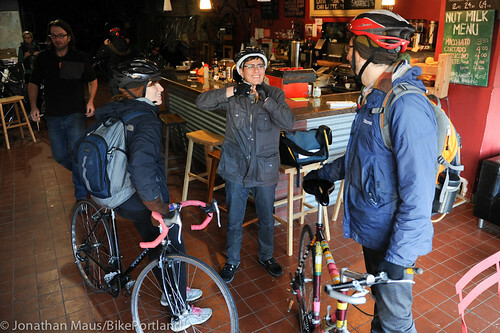 to roll inside the Red Lantern bike shop cafe. 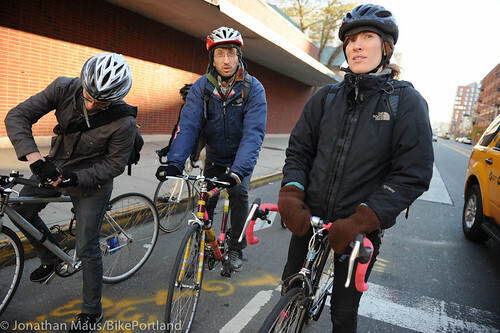 "I hate riding in Manahattan," Molly shared before we rolled out, "during commute hours it's especially crazy." "I would rather not get stressed out before I even get to work," she added. 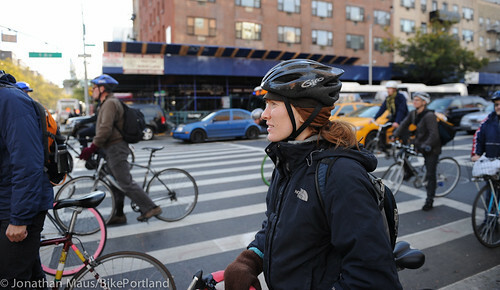 Just three days after Sandy hit, Molly was ready to face her fears and New York's vaunted new bikeways would be put to the test. Leaving the shop in Brooklyn, we easily connected to a buffered bike lane on Flushing Ave. I had learned earlier in the week from a NYC DOT staffer that this section of Flushing is part of the 14 mile Brooklyn Waterfront Greenway. 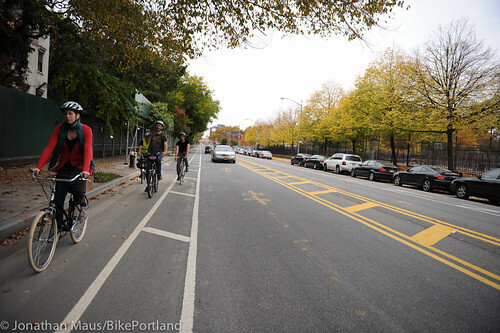 In order to get the space for this buffered bike lane we enjoyed that morning, the DOT removed 300 auto parking spaces. 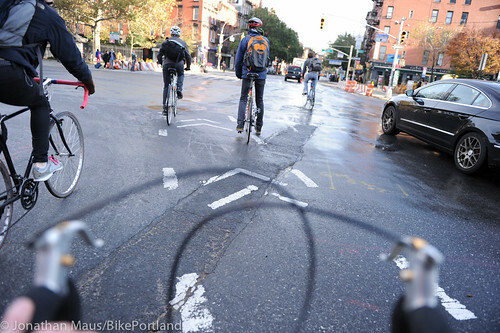 As we rounded the corner and made our way to the Manhattan Bridge approach at Sands Street, we came upon what might be the best example of bike infrastructure I saw on my entire trip. 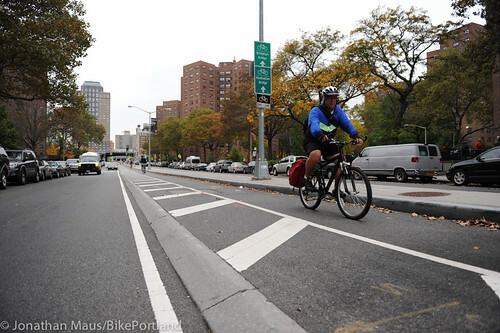 For two full blocks leading south from Navy Street to the Manhattan Bridge, the NYC DOT has built a center-running, separated-grade, two-way cycle track. For the first block it's placed up on a mountable curb (which is rounded, so you can roll up or down it with ease). 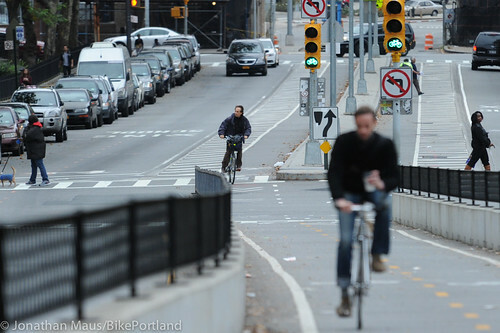 Where the cycle track crosses a street, there are bike-only signals. As Sands approaches the bridge, the path then becomes its own bike highway in the middle of the road, separated from auto traffic by a full concrete median on both sides. At the next intersection, there's another bike-only signal and a diagonal crossing that takes you right up onto the bridge path. Once up on the bridge, the path serves bike traffic well, although it's a bit narrow. 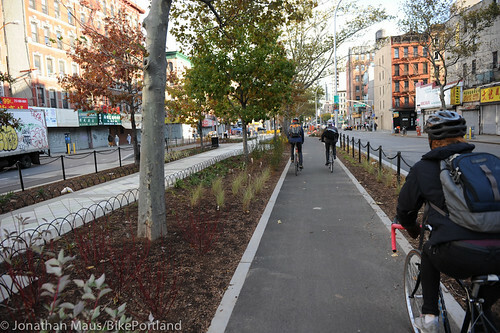 As New York City bike traffic goes up, this (and many other) key paths will be over-capacity. And it's beautiful at night! So far, Molly was doing great. But we still hadn't reached Manhattan. Rolling over the East River into Manhattan, we made our way to Allen St. What the DOT is doing on Allen is fantastic. 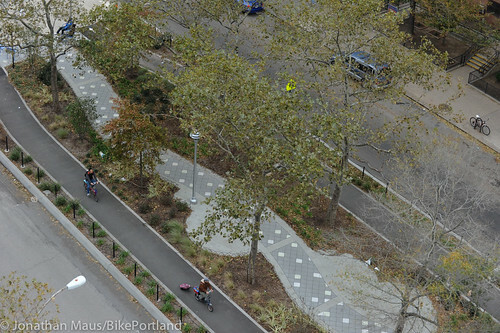 What used to be a forgotten center median strip, has been transformed into a park-like environment with separate, dedicated paths for biking and walking. The DOT first claimed the road space by painting green, bollard-protected bike lanes, now they are going back and completing the full, capital project block-by-block. They are replacing the on-street protected bike lanes with dedicated, bike-only paths that wind through a gorgeous, park-like median. This facility on Allen is fantastic, but crossing Manhattan's huge avenues can be a bit scary (especially since you're way out there in the middle of the intersection). Thankfully, the crossings were actually easier thanks to Sandy. With all traffic signals still out due to the storm, we were personally shepherded across by traffic officers. 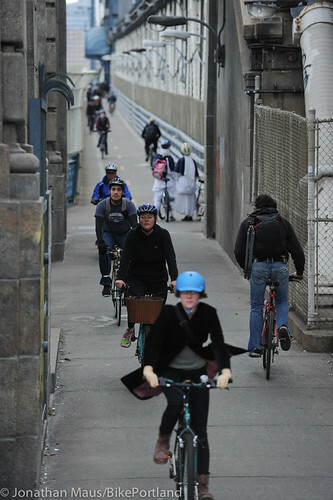 The post-Sandy bike crowds in Manhattan made the crossings much easier. 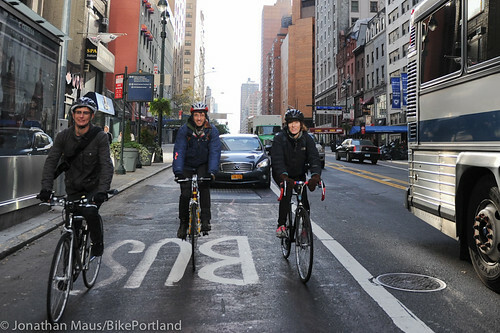 Once we successfully scrambled across the big streets like Delancey and Houston, we made our way onto the protected bike lanes on 1st Ave. This is another one of NYC DOT's marquee projects. They took a major auto thoroughfare and implemented a transit-only lane on one side (they call it Select Bus Service) and a green, protected bike lane on the other. It's beautiful on paper, but the reality can be a bit ugly; especially for a novice rider like Molly. 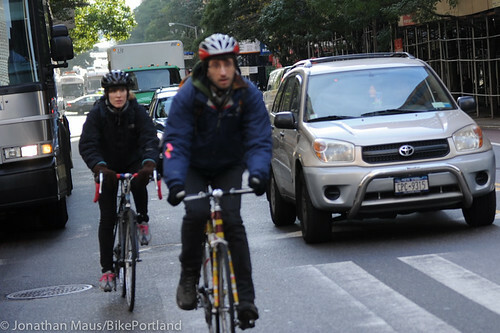 The bike lane is very frequently blocked by illegally parked cars and trucks, people routinely biking the wrong way (1st Ave is one-way), walkers, joggers, and then there are the "mixing zones" at every corner where bike operators must use caution and share the space momentarily while cars turn left. Each one of those hazards presents risks that could be enough to scare off timid riders. A common sight, especially on weekends. A "mixing zone" in action. As we made our way up 1st Ave, Molly was still riding calm and steady. She seemed to gain confidence with each obstacle we overcame and with each new spin of the cranks. We then headed west on 34th Street. That was a mistake. 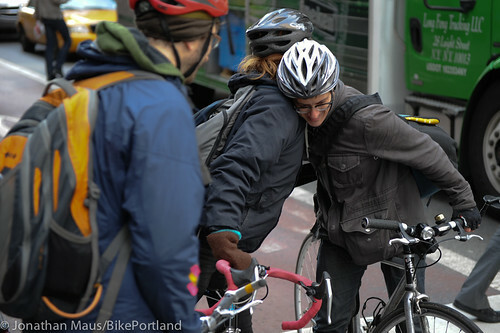 The street has no dedicated bike space and is only two lanes in each direction — with one of them being a busy, bus-only lane. And it was a slight uphill. I started to think that after such a pleasant ride, this last stretch would surely scare Molly off for good. Buses blared behind us, and cars came up fast when we tried to get out of the bus lane. We were in no man's — or woman's — land. Luckily, all four of us stayed strong and kept up a good pace. I was too stressed out to focus the camera! With a bit of relief, we reached Molly's destination at 5th Ave. I didn't have to wonder how she felt. The hug she gave our leader Chris and the big smile on her face said it all. It took us about 38 minutes to get from the Fort Greene area of Brooklyn to 34th St and 5th Ave in Manhattan, a distance of about five miles. That's comparable to transit on a normal day and twice as long as a car (without traffic). 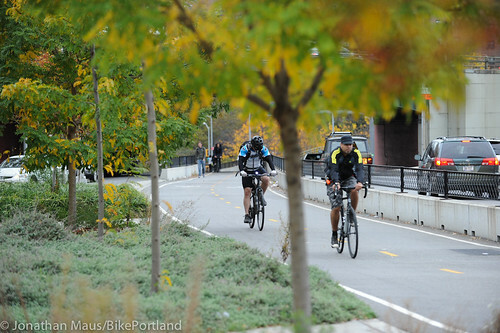 And — most importantly — almost the entire route was on protected bikeways. 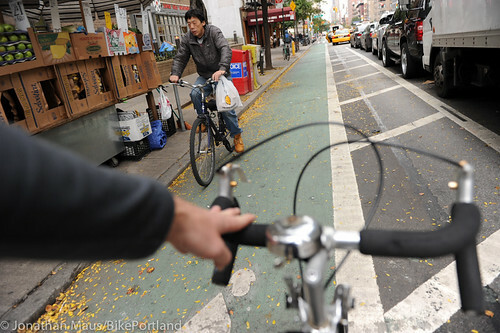 It was a real-life testament to the work NYC DOT is doing to prioritize bicycle travel. 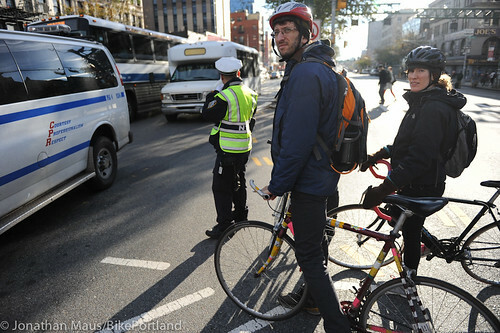 The circumstances of Sandy got a lot of New Yorkers onto their bikes for the first time. 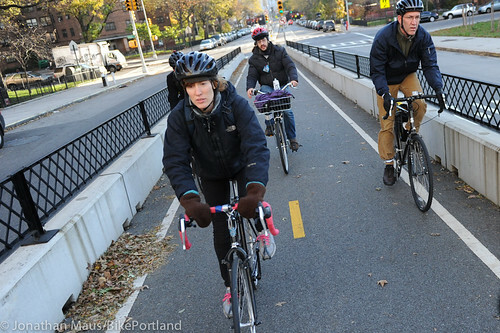 What Molly shows us is that with a supportive community and excellent, bike-specific infrastructure, there's a good chance many of them will will keep riding. 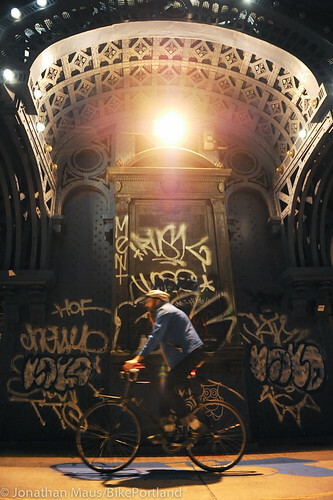 — This story comes from my recently completed trip to New York City, which was made possible by Planet Bike, Lancaster Engineering, and by readers like you. Thank you! You can find all my New York City coverage here.